On June 5, 2018, a cultural action "Turkmenistan - the heart of the Great Silk Road. Touch" was held in Moscow. A colorful action was held in the halls and on the territory of the Museum of the Roerichs (branch of the State Museum of the East), designed to reflect the theme of the relationship of the Great Silk Road with the historical mission of the Turkmen state as the central link of economic and humanitarian cooperation of the states of the region. The organizers of the action - the Embassy of Turkmenistan in Russia and the administration of the State Museum of the East included the opening of an art exhibition of paintings by Turkmen painters on the theme of the Great Silk Road and a folkloric festival presenting the guests of the action with Turkmen songs and dances and Turkmen folk gastronomic traditions. 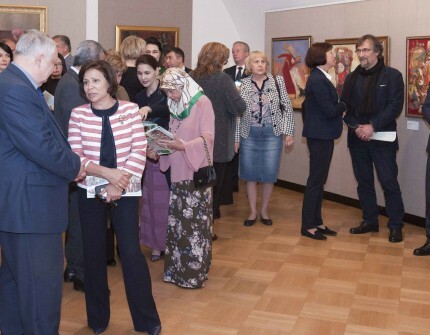 An opening ceremony of the exhibition of works by Turkmen masters of painting was held in the halls of the Museum of the Roerichs with the participation of the heads of foreign diplomatic missions, accredited in Moscow, deputies of the State Duma of the Federal Assembly of the Russian Federation, representatives of Russian creative unions, Turkmen students of Moscow universities and representatives of the media. The guest of honor of the action was the three-time Olympic champion, deputy of the State Duma of the Federal Assembly of the Russian Federation Irina Rodnina, who noted the unique coloring of the works of Turkmen artists, giving the viewer a lively and vibrant sense of the greatness of the national culture. Speakers at the opening ceremony of the exhibition, representatives of the scientific and creative community noted that the nationwide thematic action "Turkmenistan - the heart of the Great Silk Road", initiated by President of Turkmenistan Gurbanguly Berdimuhamedov, continues throughout the whole of 2018 and has a variety of directions: from historical-cultural to modern socio-economic. Conferences, exhibitions, seminars, scientific symposiums held within the framework of the action (both in Turkmenistan and abroad) allow an objective assessment of the historical path of the Turkmen, get acquainted with their national and cultural identity, traditions, customs and life standards, deeply realize the invaluable contribution of the Turkmen people in the world scientific, economic and cultural progress. Having inspected the exhibition, the participants moved to the museum's courtyard, where a bright folklore event took place, which allowed the participants of the event to touch Turkmen song and dance national traditions. The traditional Turkmen dastarkhan with its aromatic pilaf and other dishes of national cuisine was also generous.